Lawrence Revsine, the John and Norma Darling Distinguished Professor of Financial Accounting, died May 7 at the age of 64. Professor Revsine was a longtime member of the Kellogg School faculty and an honored teacher and researcher. Respected Kellogg School accounting scholar Professor Lawrence Revsine died May 7 in Chicago. He was 64. 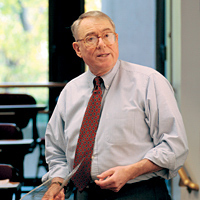 Recognized by his colleagues and students as an outstanding professor who could combine theory and practice to make accounting come alive in the classroom or in his many publications, Revsine, who was the John and Norma Darling Distinguished Professor of Financial Accounting, is remembered for the passion and expertise he brought to his discipline. With textbooks such as Financial Reporting and Analysis, Revsine went behind the numbers to reveal how they could be manipulated for various ends. "There are all sorts of contracts, including bonuses, tied to those numbers that are very important to managers," said Revsine in a 2005 interview. As a result, there were opportunities and incentives to manipulate the accounting rules so that a firm's performance appeared stronger than it might be, rewarding management in the process. "Larry had a deep understanding of the forces that shape accounting practices," said Robert Magee, the Keith I. DeLashmutt Distinguished Professor of Accounting Information and Management, a longtime friend and colleague. "He was sometimes dismayed by what he saw because he cared deeply about the practice, not just the theory, of accounting. He was an inspirational teacher who prepared students for their careers, enabling them to be savvy readers of accounting information." That passion was cultivated at Northwestern University where Revsine earned three degrees, including an undergraduate business degree in 1963, an MBA in 1965 and a doctorate in managerial economics in 1968. After graduation, he taught accountancy at the University of Illinois from 1968-1971. He returned to Northwestern as a faculty member in 1971 and became a tenured professor in the Graduate School of Management in 1975. Revsine's scholarship was balanced by his commitment to teaching, something reflected in the many awards he won. He also served as member of the Financial Accounting Standards Advisory Committee from 1980-1986, and was chair of the Kellogg Accounting Information and Management Department from 1985-1993. His expertise contributed to the editorial boards of several top journals. In addition to Financial Reporting and Analysis, Revsine was the author or co-author of six other books and dozens of articles and chapters.